Hilarious prank call show dedicated to making funny, weird & insane prank calls to various amusing characters often using YOUR comments! Greg created Comment Cranks on February 3, 2017. 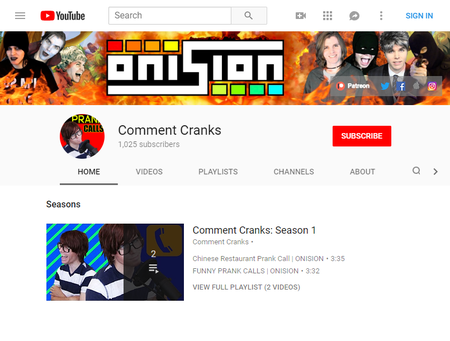 It currently has no videos uploaded and features a playlist containing two Onision channel prank videos. It is not known if Greg even uploaded anything to the channel. It seems the channel was meant to be an interactive prank channel where Greg would prank call people using his characters. It seems the characters would read viewer comments during the prank calls. This page was last modified on 18 August 2018, at 10:14.